The purpose of a website is to showcase high-quality content to its users and generate as much leads as possible. However, even by having a top-notch design and advanced features you cannot be sure that your website will reach to varied audiences. The most important aspect of a website that determines its success is search engine optimization. This is because there is no point in investing on a website if it is not able to achieve high ranks in search engine results. Apart from all the design options that WordPress offers, themes are among the best. Some of the themes that are developed by quality developers have an SEO friendly design. 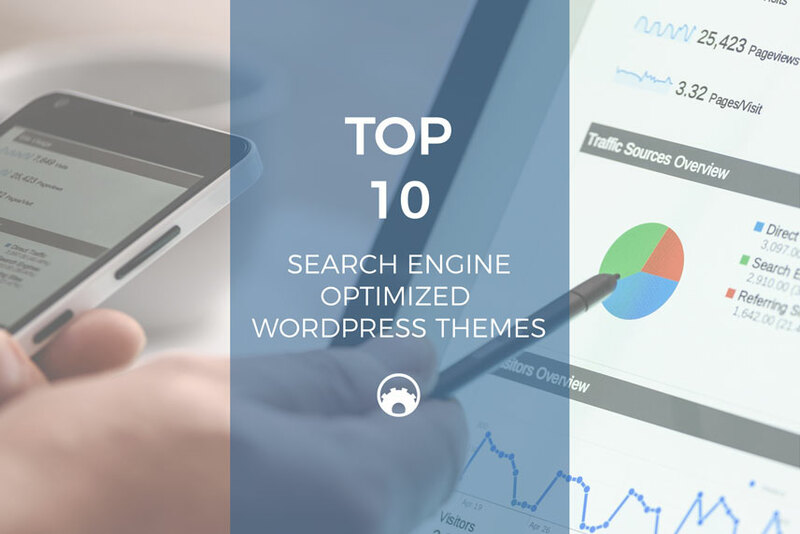 In this post, we are going to shortlist the top 10 Search Engine Optimized WordPress themes that will reduce the optimization efforts from your end. Schema is one of friendly search engine optimized WordPress themes that enables you to achieve high ranking in search engine results. One good feature housed by this theme is the inclusion of rich snippets. These snippets are really beneficial for the search engines as it gives a clear idea about the content that your website is featuring. You can also display ratings and reviews in the search engine results very easily. All these will be helpful in achieving a higher rank for the website. Schema theme has a visually appealing design and will look great on devices of every size. SociallyViral, as the name suggests, will allow your website get shares on social media platforms. Popular search engines like Google also consider the appeal of a website on these platforms. This will act as an assistance for the search engines to rank a particular website. The theme has a clean layout and features stunning share buttons. It is a lightweight and fast loading theme that is best suited for people who frequently post and want to utilize the social media platforms. The theme also features a ‘you may also like’ section that is displayed below every post. This will enable you in keeping your users engaged on the website which will be very beneficial for you. SEO Engine is a WP theme that is perfect for digital marketing agencies. The theme will offer you multipage designs along with 12 homepages. It features a nice admin panel along with two portfolio pages and five pre-set headers. You will also find a live customizer, grids and sliders along with unlimited color mixing option. A number of typography options are also available. The theme is compatible with Contact Form 7 and makes use of a premium layer slider. SEO Engine looks great on devices of all sizes and is compatible with all the popular browsers. You will enjoy a free support for lifetime updates along with all the documentation that is necessary. If you publish a lot of content on your website regularly then MH Magazine is best suited for you. You can choose from 12 available demos and build a well organized and professional layout for a website. The theme is highly optimized which means that you can target your audience in a better way. The multiple navigation functionalities of the theme will make browsing an enjoyable experience. Your visitors will have plenty of reasons to stay on the website due to the custom menu option of the theme. Those users who are looking to monetize the website with advertisements can make use of the number of ad locations for showcasing the ads. Jkreativ is a comparatively new WP theme. It is compatible with all the best SEO WordPress plugins and also has a support for Google Authorship. The wide range of customization options and features will help you in building the best website. It features a WordPress customizer tool that will help you in editing the appearance of a website. You can even preview the adjustments. With this theme, you will get an access to some useful premium products like Visual composer page builder plugin. There are many latest features like the custom right-click menus, page loader tools, smooth parallax effects and much more that are included with the theme. Vellum WP theme has a collection of 12 pre-made styles that can be instantly applied to your website. This will help you in giving your site a distinct look. The theme is a completely flexible one that can be used for different purposes. Apart from the amazing designs, there are some outstanding functionalities and features that set this theme apart from the others. The theme has a highly mobile friendly design and has some premium plugin integrations. All these can be easily used by you. MagXP is a highly search engine optimized theme that will offer you 10 different layouts and modes. It doesn’t matter what genre of a website you want to develop, the theme consists of a template that will perfectly fit into the design of your website. Even if you are not able to make up your mind in choosing any of the layout options, it really doesn’t matter. The settings that are present by default will give a professional feel to your website. The theme features a drag and drop homepage builder tool that will give a personalized look to your website. MagXP has been developed by keeping in mind the best SEO practices so only a minimal effort is needed from your end. Brixton is a colorful, attractive and sleek WordPress theme. The complete focus of the theme is to design the website in a professional manner so that the users have a memorable experience. The layouts housed by the theme are seamless and dynamic in nature. It features a live category aggregation that will create an amazing user experience for your visitors. All the visuals and multimedia content is available in a clear cut and clean manner. The theme features some advanced options for post formatting that will help you in customizing the postings. Along with these engaging sliders enhance the visual appeal of this beautiful theme. Brando is an extremely reliable and elegant theme that is easy to use. The theme will give you an opportunity to develop and design a highly responsive and a modern looking website within minutes. There is no need to have a command over coding as the theme has some of the most engaging and top-notch features. The design of the theme is based on HTML5, engaging and dynamic CSS3 styling, along with powerful jQuery capabilities. The theme has all the needed SEO enhancements that will enable your website to achieve a higher ranking in search results. Due to the minimal and lightweight coding used in them, the overall load time of a website will be reduced significantly. Tower is an impressive WP theme that will enhance the layout design of your website. The best aspect of the theme is that it consists of a documentation that consists all the relevant information. This information is similar to a tutorial and gives an explanation about the features that are included in the theme. In case you face any issues while using the theme there is a support team that will provide assistance to you. The theme will offer you 18 amazing demos to choose from. With the help of these, you can easily implement any of your website design. Above is a collection of the top 10 search engine optimized WordPress themes that will increase the visibility of your website and generate more traffic. All these themes are good in their own respect. However, the best way to choose any of the themes is to see whether it is able to fulfill the purpose of your website or not. Lauren McLaren was born and raised in Australia. She is working for Digital Muscle, providing Web Design Services in Sydney. She’s hardworking, competent and trust worthy. Her role within the company is to design websites. In her spare time, she loves to read, cook and watch movies.